Fresh from its debut back in June, Nike 's Air Max 270 Futura jumps back on our radar in an eye-catching red, white and blue color scheme. This patriotic colorway doesn't abstain from the dad shoe trend, and features a predominantly white mesh upper that nods to mid-'90s sneaker styles. Navy blue paneling and eyelets accentuate the retro design, while a signature Air Max 270 heel air bag gives the shoe its modern built. 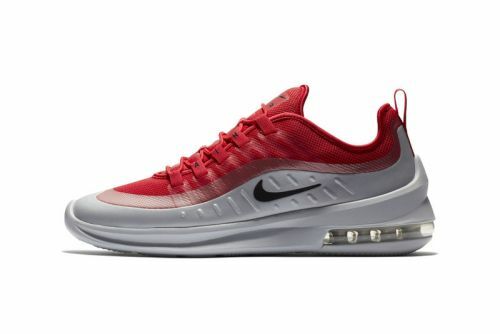 Nike's Air Max Axis Flaunts in "University Red/Pure Platinum"
We had our first look at Nike 's Air Max Axis back in March, and while we're still waiting on official release notes, the Swoosh's newest Air Max model has surfaced in a familiar "University Red/Pure Platinum" colorway. The contemporary runner fuses Air Max 98 codes with modern technology. This version sees a seamless mesh upper in "University Red" with a metallic silver synthetic overlay and Air Max sole unit. The two-tone look is accented by black detailing at the "AIR" lettering on the lace eyelets, as well at the Swoosh branding throughout.